Sean On Leave — Changing the World…One Vacation At A Time. I’ve finished up my first two days at ASF and things are going very well. I teach in the morning and in the afternoon I prepare my lesson for the next day. So far I’ve covered IT Training Strategies and Desktop Computer Security. Tomorrow is PC Troubleshooting and then we start looking at web development and WordPress. I’m also hoping to complete some project work while I’m here. I will be evaluating Deep Freeze for their computer lab, which is a system which projects public computers so only the administrators can change or update them. I am also looking to redo their website and perhaps set up the ASF on GoogleApps to give them their own email, calendaring and collaboration system. It’s an exciting opportunity, but the Internet infrastructure here is still developing and great web tools don’t help much if your pipe isn’t big enough. Salamat Datang is Indonesian for Welcome. We also met a group of the students at Agapé, all of whom are participants in the Foster Child program which sponsors their education. We were even treated to some song and dance by the children which was wonderful! Here’s the song they sang us. Everyone here has been wonderful. It’s been particularly great to have some time ahead of the bulk of my volunteer work to meet and spend time with the staff and being able to have some great prep time. I’m really looking forward to my first day of teaching tomorrow. The Agapé Social Foundation (ASF) is a non-profit organization dedicated to providing education and training to those who cannot afford it in the local community. Located in Malang, Indonesia, it was founded in 1997 by Dr. Yohandoyo, a local medical doctor and prominent member of the Malang Rotary Club. The ASF is dedicated to helping build the skills and education of those who are in need, to enable them to provide for themselves and contribute to the community in turn. The ASF is funded by private donations from around the world, but primarily from the Netherlands and often by fellow Rotarians. The ASF is an officially registered organization in Indonesia with community support and provides full financial reporting to its donors. The Agapé Social Foundation is dedicated to local, direct-action assistance which helps builds capacity in the community. The ASF has a proven track record and has consistently succeeded in providing a hand up to those who need it most for more than a decade. The ASF’s began its work with the Foster Child Program. This program provides underprivileged children in the area with all the supplies and resources needed to attend school. Indonesia does not yet have universal public education, thus a lack of funds can unfortunately make it impossible for a child to attend school. 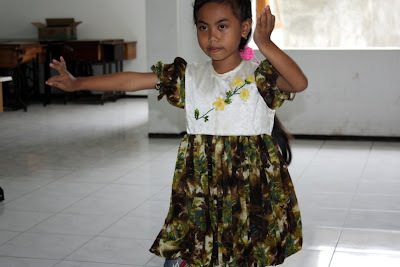 This program also provides the student with one new dress or outfit per year, typically at Lebaran, the Muslim New Year, or at Christmas. This program costs approximate $100 USD per year per child. In its first year the ASF was able to foster 24 children through the generosity of a single private donor. Many of these children have been able to complete high school because of this program and some program alumni even work for the ASF today. Approximately 500 children have participated in the program so far. For the 2009 school year, there are almost 70 children being sponsored through this program. However, the demand for this program exceeds currently available funding, with more than 50 children on the waiting list. Through consultation with the local Lurah, the neighbourhood office, and community, the Agapé Social Foundation expanded its services to include vocational training. In 2002 the ASF received a very generous private donation that allowed it to substantially renovate its training centre. In addition to this vocational training the ASF also provides Computer Skills training and English As A Second Language training. This development program installs a well and water filtration system which is able to provide clean water to 200 families or approximately 800-1000 residents. Without this program, the residents of these areas would be without a clean water source and be subject to water-borne pathogens such as the e. coli bacteria, salmonella which can cause typhus and ascariasis a parasite which infects the intestinal tract and often affects children. Without this source of clean water, families often face the increased expense medical bills and purchasing clean water when they can, decreasing their already very limited family budget. This program provides these neighborhoods with a safe, sustainable and free supply of clean water, essential to their well-being. This program has been implemented at 4 locations and costs approximately $250 USD per site. This development program funds essential home renovations for families who have inadequate housing. Fixing leaking roofs, expanding a house from a single room and installing plumbing are the types of renovations done by this program. The housing which receives these renovations are often made from essentially temporary materials such as bamboo, thatching, dirt floors and corrugated metal. Once upgraded, these houses have improved conditions such as brick exteriors, waterproof roofing, concrete floors and indoor sanitation facilities. These renovations also provide additional living space, building separate cooking and bathing rooms from the main living area. This program provides families with dry, clean and permanent structures to live in. This program has helped more than 10 families and costs approximately $150 to $200 USD. This resource program fully funds and the purchase and delivery books to local libraries. 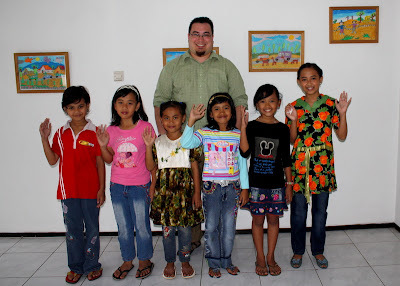 It is run by the Indonesia Rotary Club and funded by International Rotary Club donations. This program makes a 5 year commitment to send books annually. Currently this project in Malang has been running for 2 of the 5 years. Each year a large shipment of new books is sent of approximately $300 USD worth of books, which is approximately 150-200 books. There are 4 locations which receive these books in Malang. 3 of the locations are local schools and the fourth is the Agapé Social Foundation. This has been an amazing trip so far. I’ve travelled with my father to his home town of Pekalongan, explored his home county of Indonesia, met my Indonesian family and even started to learn to speak a little Indonesian. And I’ve eaten amazing food every step of the way <grin>. Yesterday my dad flew back to Jakarta and today he’ll fly home to Canada. He took fantastic care of my while we were together and was great to travel with. I am very lucky. I spent every day for the last three weeks with my dad and we had a great time. This will be an unforgettable trip for many reasons, but one of the most important will be the time I spent with my father and his family. 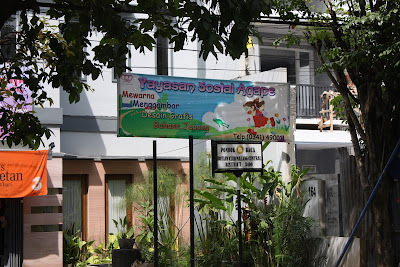 Starting tomorrow I will begin teaching at the Agapé Social Foundation, the non-profit organization founded and run by my uncle Dr. Yohandoyo. I will be teaching IT skills from PC Security to Web Development. The staff here are very eager to learn which is a dream for every instructor. I am staying with my Uncle and his family – who are wonderful and taking very, very good care of me. So, I’m not on my own here in Indonesia, at all. But I am without my dad…who I know is excited about returning home and seeing my mom and their dog, Daisy<smile>. I’ll miss him these last two weeks in Indonesia, but it will also be good to have some of my own time and memories on this trip. Salamat Jalan Papah – I hope you have a safe trip home. I’ll see you again in a couple of weeks. Our first stop after Jakarta is Bandung. Far from the smog and brutal heat of lower-laying Jakarta is Bandung, up in the mountains where it is still hot, but the mornings and evenings are lovely and everything is a bit slower than the relentless pace of Jakarta. 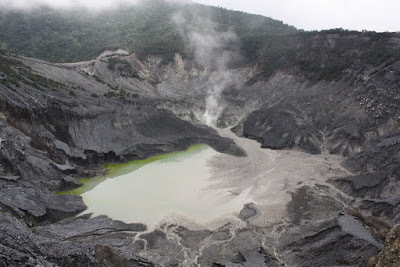 One of the first places we visited was Tangkuban Perahu, an active volanco just over 2000 meters above sea level. At the peak there is a crater filled by a hot-spring and the delightful aroma of sulphur. Despsite the odour, it was a beautiful site and it was delightfully cool at that elevation. The name translates roughly to “upturning of (a) boat” or “upturned boat” in Sundanese, referring to the local legend of its creation. The story tells of “Dayang Sumbi”, a beauty who lived in West Java. She cast away her son “Sangkuriang” for disobedience, and in her sadness was granted the power of eternal youth by the gods. After many years in exile, Sangkuriang decided to return to his home, long after the two had forgotten and failed to recognize each other. Sangkuriang fell in love with Dayang Sumbi and planned to marry her, only for Dayang Sumbi to recognize his birthmark just as he was about to go hunting. In order to prevent the marriage from taking place, Dayang Sumbi asked Sangkuriang to (1) build a dam on the river Citarum and (2) build a large boat to cross the river, both before the sunrise. Sangkuriang meditated and summoned mythical ogre-like creatures -buta hejo or green giant(s)- to do his bidding. Dayang Sumbi saw that the tasks were almost completed and called on her workers to spread red silk cloths east of the city, to give the impression of impending sunrise. Sangkuriang was fooled, and upon believing that he had failed, kicked the dam and the unfinished boat, resulting in severe flooding and the creation of Tangkuban perahu from the hull of the boat. Or perhaps I should say the Mall State. The shopping in Indonesia is crazy…everything seems like it’s filled with stores. From a blanket-on-the-street operation selling shoes to gleaming stores in epic malls which provide all the latest fashions from Paris and everything in-between, including bootlegs CDs, knock-off handbags, and DVDs of movies that are still in the theatre. And then there is the Indonesian Mall. These things are enormous! West Edmonton Mall, located in Western Canada, is still the largest mall in the world as far as I know…but it’s more like a sprawling city with a roof. The malls in Indonesia don’t have the luxury of flat, Canadian Prairies to build on. So they build up. And the build with gorgeous attention to detail. For those of you counting at home…that’s six…S-I-X levels of air conditioned, tiled, mirrored, gleaming, perfectly lit shopping. The only sad part of the shopping here at all is the fact that the Indonesia Rupiah has rallied against the Canadian dollar since we arrived and I’m down about 10% on the exchange rate since we arrived <grin>. 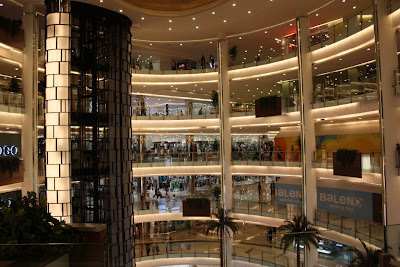 I also have some great photos of a mall in Surabaya, the second largest city in Indonesia. I’ll be sure to post those as well. Indonesia is filled with people selling food. I can’t overstate this. Absolutely everywhere you go, there are men pushing or carrying everything they need to make a quick hot meal. And if you’re looking for something a little more permanent in your eating establishment, the next step up is a Warung. The best I can do to translate this word is “Café”; but even that isn’t quite right. Warungs are almost always open-air shop, usually tiny and often one or two person operations. However, Warungs also stray into what we would clearly consider a restaurant in Canada. In Indonesia, the restaurant is often referred to as the Rumah Makan – or Eating/Food House, although the term “Restoran” is also commonly used now. On our first morning in Indonesia, my father was interested in exactly one thing and it wasn’t going out for breakfast. He wanted breakfast to be brought to us…and he wanted Bubur Ayam. Bubur Ayam is Chicken Congee (a porridge made with rice). 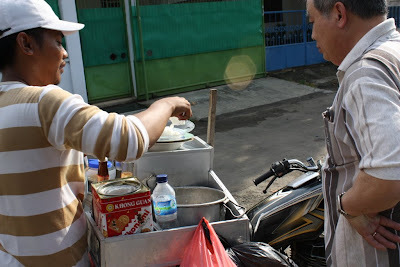 In Indonesia, this is a common breakfast food and vendors with a cart or small rig on the back of a bicycle wind their way through narrow neighbourhood streets calling out or clanging a spoon against a porcelain bowl ringing out the announcement of morning among the rooftops. Dad was very excited with the prospects of Burbur Ayam for breakfast…but we waited and waited and nothing. 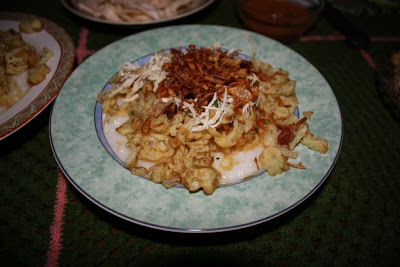 Just as we had given up, I heard a call that sounded enough like “Bubur” for me sound the alarms <grin>. My dad jumped up and ran downstairs from the bedroom, where we were hiding from the already grueling morning heat of Jakarta in the only air conditioned room in the house, to see if he could catch us some breakfast. He was successful, and I was able to watch the vendor assemble our breakfast on the portable kitchen he had set up on the back of a motorcycle. It was a much more involved process that I imagined, and I’m really grateful I was able to watch him. It was great to see how Bubur Ayam is assembled, especially since it is a favourite at breakfast buffet’s here…so I’ve been able to put together my morning porridge like a pro here. On top of the Bubur is fried shallots, Jah Quay – a type of chinese fried bread, cut into think slices, green onions and shredded chicken. This is, of course, served with spicy Sambal – a sauce made of chili peppers and probably has the best claim to being the national food of Indonesia. Along side the porridge and the chili Kropoek, a crunchy cracker made from tapioca flour and then deep fried is also served. The Bubur was savory, delicious and wonderfully silky smooth which was a great counterpoint to the crunch and chewiness of the toppings. Burbur Ayam is one of the many things my dad has added to the list of things I need to learn to cook while I’m here. If we’re lucky, I’ll even manage to grab step by step photos of a cooking lesson and I’ll blog the whole thing. Whenever I take photos when travelling, I’ve noticed everybody likes pictures of animals…especially cats and dogs. This picture is from my first morning in Jarkarta, after I took the sunrise picture. 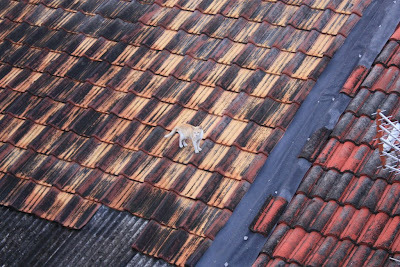 These roof tiles are extremely common in Indonesia. This was also taken from the roof of my Cousin Arif’s house. This is one of my favourite pictures I’ve taken on this trip. I love the tiles, the cat wandering of the roofs and the glimpse of the TV antenna. It’s a good snapshot of Indonesia; things may seem old here…but the modern and the new is always just around the corner just waiting to pounce. Well, I finally have found a reasonably fast connection. It’s a very nice, clean and non-smoking (a important issue in Indonesia <grin>) business centre with about a hundred seats of widescreen, high-speed internet workstations running Windows – each kitted out with a webcam. I’m really looking forward to videochatting with the kids in the next few days. It appears many of my readers have been clicking around the web gallery of the pictures I’ve uploaded so far…but I most of which I haven’t posted about yet. Serves me right I guess. Anyways…since I have found some lovely proper High Speed Internet, it’s clearly time to catch up on my posts. Our flight from Toronto flew direct to Hong Kong. I was expecting to fly over Vancouver or LA, but instead we went over the top of Canada, Greenland and Russia. We then flew straight down over China all the way down to Hong Kong. I might never visit the Arctic, but at least I got to see it with my very own eyes and even snap a picture or two of it. Now that’s what I call a sweet bonus!